"His twin sister is coming for the holidays... ...and it ain't pretty." 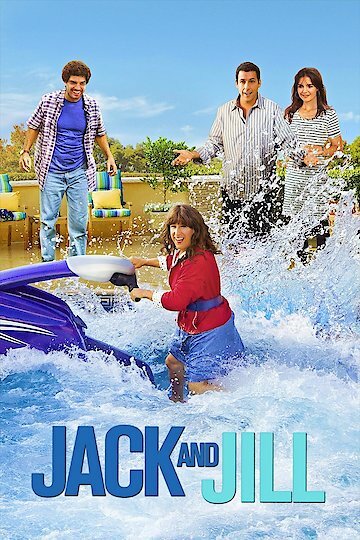 Jack and Jill is a heartfelt family comedy film which goes through the life of Jack and Jill who grow up as twins who obviously love each other while Jack still tries to avoid her. The movie starts off showcasing how the both of them are always close with Jack constantly being annoyed at what Jill tries to do. Jill is somewhat the dumber one of the two while Jack is the smart one. In the film, the story shows them all grown up with Jack being a successful advertising executive. As the story progresses, Jill decides she is going to end up having to spend the holidays with Jack's family. She shows that she has an open ticket, so she can fly home whenever she wants. Jack decides to help Jill with her love life to help get rid of her as much as possible since she never married a man at all. She tries online dating and fails when her date runs away in the bathroom while eating at the restaurant. Jack realizes that while Jill is still with him, he has to work. He is told by his client that he needs to get Al Pacino in their new Dunkin Donuts commercial. Since Jill was still depressed from her bad online dating, Jack decides to take her to a big Lakers game where he knows Al Pacino is to help convince him to be a part of the Dunkin Donuts commercial. Al Pacino promises that he will do it, provided that he gets a date from Jill. Jill doesn't want to go on a date with him because she likes another guy from Jack's neighborhood. Jack decides to masquerade as Jill and decides to go on the date with Al Pacino. He realizes how much his sister really means to her and how much Al loves her. So Jack decides to make things right with her and stop making her feel bad about her. Jill ends up realizing that Jack's gardener in the end really likes her, so she finally experiences true love. The story is still nicely created just like all of Adam Sandlers movies nowadays. Rotten Tomatoes rated this film with 3%, but the film was still nicely accepted by the audiences who watched this film. Adam Sandler won all the "worst" awards, including worst screenplay, worst actor, and every award at the Golden Raspberry Awards. However, the film is not as bad as most reviewers and critics say. The film was still widely accepted by many audience members who watched the film. Jack and Jill is currently available to watch and stream, buy on demand at Amazon, Vudu, Google Play, iTunes, YouTube VOD online.